At a meeting with Russian parliamentary deputies in Grozny on March 25, the Moscow-backed Chechen President Ramzan Kadyrov announced that the counter-terrorist operation, which has been going on in Chechnya since 1999, is nearing completion. According to him, on March 31 the National Anti-Terrorist Committee is due to pass a resolution declaring that it is over. This will be followed by an immediate lifting of all the emergency restrictions currently in force. We interviewed by telephone a rank-and-file member of the mujahedin from the dzhamaat of the well-known Chechen field commander Khuseyn Gakayev. He is 28 years old, his call sign is Kuteyb, his real name is Aslan, and he is a native of Chechnya’s Vedensky district. At the start of the conversation Aslan apologized for being unable to express his thoughts in fluent Russian, as he grew up during wartime and did not have a chance to learn the language properly. The following transcript adheres as closely as possible to the actual recording. 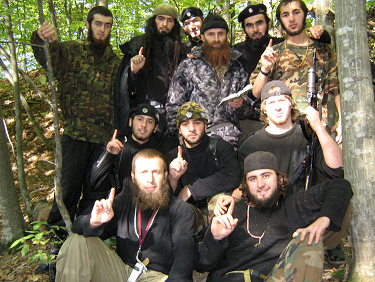 PW: Ramzan Kadyrov has said that according to his data no more than 70 guerrillas are left in the mountains of Chechnya. Does this figure correspond to reality? Kuteyb: It’s certainly not true, because in our Gorno-Shalinsky sector of the Ichkerian Vilayet there are 60 mujahedin. In that sector alone. And there are a great many such sectors. Ramzan and the other munafiqs and kafirs just say what’s convenient for them. It’s something that they need. Inshallah, we are many. There are hundreds and hundreds of us. And hundreds more want to be in contact with us. The young people here are very law-abiding. They all want the word of God to be greater than Russia's Constitution and all constitutions. Our Constitution is the Koran – it’s the Sharia. To us, Ramzan is a nobody. Putin and Medvedev are not serious people. They speak for themselves. In a vacuum. PW: Representatives of the State Duma Committee on Security have confirmed that the situation in Chechnya has changed very much for the better. Has the power of the underground really been eroded, and do the guerrillas no longer represent any serious threat to the authorities in Chechnya? Kuteyb: I swear by Allah that the mujahedin have not been weakened. The mujahedin are many, and they now have power. This year of 2009 will be the year of victory for the mujahedin. In 2003, 2004 and 2005 we did not have this flow of young people to us. Now everyone wants Laillah illalah to be supreme in the Caucasus. All the young people want this. PW: Russian State Duma Speaker Boris Gryzlov has said that the number of federal forces in Chechnya should be reduced, since the financial crisis makes it difficult to maintain such a large military grouping. If some of the troops are withdrawn, will Ramzan Kadyrov be able to maintain the situation with his own forces? Kuteyb: Kadyrov has little power, but when the Russian troops are withdrawn from Chechnya, the Kadyrovites will lose heart. Their spirit is generally weak. Previously it was the Russians who carried out the special operations, but now it’s up to the Kadyrovites. Their operations are very weak, because they have no strength of spirit. They’ve stopped going to work, as they’re not being paid because of the financial crisis. We have reports of this. They are already talking about leaving Chechnya altogether and going abroad. PW: Why will 2009 be the year of victory? Kuteyb: We think so because for the last two years we’ve been in the villages. There are the mountain districts – Nozhai-Yurtovsky, Vedensky, Shatoisky – in those districts the mujahedin are already operating openly in the villages. Nowadays we normally live in houses, but earlier we didn’t. It’s a very good thing that the people support us, understand us. PW: But one can’t compare Kadyrov’s resources with those of the underground. Kadyrov has the support of Russia, with all its money, its military power and weapons, and you don’t have even a thousandth part of that. Kuteyb: Yes, he has a lot of resources. He has Putin, he has Medvedev, the whole multimillion army of Russia. Even if he gets the support of America and others – the whole world – Allah will be with us. He will help us. The mujahedin have a good Iman now. And that is our weapons. Our weapons are a Dua. But we also have resources, we are doing well with money now. Many believed that when the Caucasian caliphate was declared we would have no resources. But, Alhamdulillah, it was even better here. All the mujahedin support Dokka Umarov. We love him, inshallah, and he is our Amir. PW: Have you already begun your spring and summer season of fighting, or are you only planning? Kuteyb: During March all the mujahedin have come out of the forest. We are located in the villages or near them. We normally move about the villages in cars. The security situation is fine. In 2006 and 2007 it was a bit dangerous, but now there is no problem. In April we are going to conduct major operations. There have already been attacks: in Vedensky district, in Grozny and other places, but they don’t talk about them because they don’t want anyone to know about us. PW: And are there people among the Kadyrovites who are helping you? Kuteyb: Yes, of course. They keep constantly in touch with our Amir, they work for us, they give us information. They have a normal Iman. Last year was terrible for Kadyrov. They helped us. Laillah illalah - there is no God except Allah - an Arabic phrase from the Shahada (Muslim declaration of belief).